New office space of 1,825 sq. ft. will be created from a conversion of part of the Grade 2 star listed Fenham Hall. 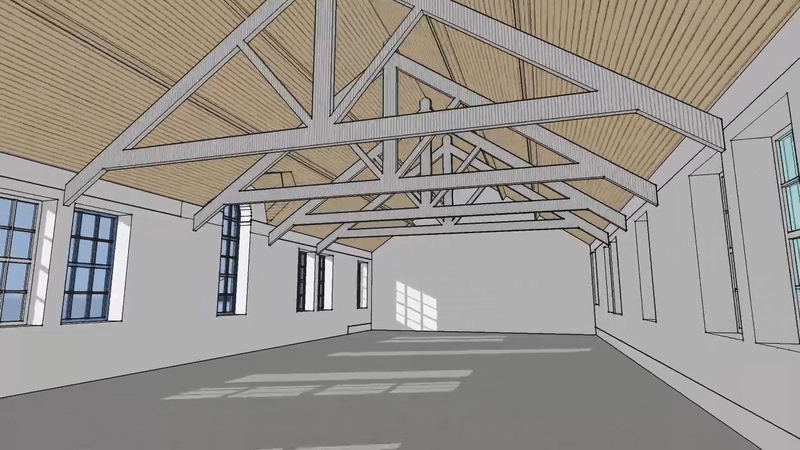 The ground floor was once part of the refectory built in 1943 for St Mary’s Teacher Training college and the First Floor will be an open plan office with exposed timber trusses formed by opening up the existing dormitory accommodation. Architect for the project Peter Lambert of Fenham Hall Studios said “these are wonderful historic buildings in a beautiful setting, but we had a problem with access following the end of a lease with Newcastle University who occupy much of the adjacent property. We also had to consider the very strict constraints set by the buildings listing which meant that any conversion and modernisation of the buildings had to take full account of their Historic Status”.